The Triad is a medical condition often observed in physically active girls and women, and involves any of the three components. 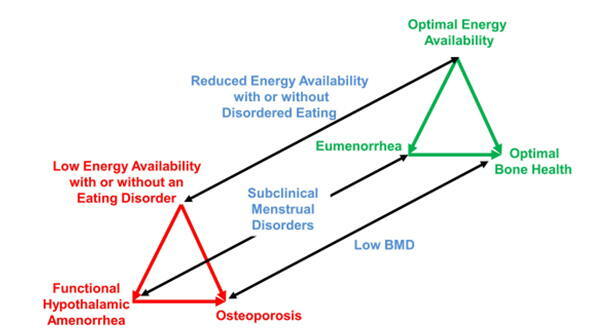 Female Athlete Triad is a syndrome that evolves from the interrelationship between low energy availability with or without disordered eating, low bone mineral density, and menstrualdysfunction. The clinical manifestations include eating disorders, improper nutrition, functional hypothalamic amenorrhea, and osteoporosis. Not all clinical signs must be present to diagnose Female Athlete Triad. Female Athlete Triad commonly occurs in adolescent or highly competitive female athletes. This syndrome is most common in adolescent athletes, largely due to their skeletal immaturity and naturally low Bone Mineral Density (BMD) being more susceptible to physical and metabolic stressors. Along with health care providers, all coaching staff members of high level and high school women’s sports teams should be highly aware of signs of this disease in order to manage the health of their players. It is also recommended that all female athletes are screened for Female Athlete Triad on a yearly basis. Early signs of the Female Athlete Triad include weight changes, repeated fractures, and decreased energy. Longterm effects of Female Athlete Triad include low peak BMD, Osteoporosis, Thoughts of suicide during long term disease process, and kidney and liver dysfunction. Below is a Female Athlete Triad Coalition diagram for the clinical spectrum of Female Athlete Triad. The red triangle represents pathological changes, the green represents clinical findings needed before return to play is recommended. The International Olympic Committee (IOC) has developed a broader syndrome called Relative Energy Deficiency in Sport (RED-S). It has been described by the IOC as an umbrella term for energy disorders in athletes. RED-S is still a relatively new attempt to create a general guideline to the identification and treatment of athletes across genders and pathologies. There is still only shallow research supporting this evolving term, but as of now the IOC considers Female Athlete Triad part of their over all RED-S diagnosis. For the purposes of this page, the ACSM definition of Female Athlete Triad will be discussed. The IOC does not yet have much evidence to support it's use for predicting and understanding pathology. Due to inconsistencies and limitations in criteria defining Female Athlete Triad, study methodology, and experimental design there is an evident discrepancy in the literature when determining the prevalence of the triad. Commonly patients present with only one of the conditions of female athlete triad. These patients range from 16% to 60% of female athlete triad patients. Patients clinically presenting with two conditions at the same time range from 3% to 27% of patients. Clinical manifestation of all three conditions of female athlete triad simultaneously is reported to occur from 0% to 16% of patients. This is rarely seen outside of severe cases. Development of Female Athlete Triad is possible for sedentary and normally active females. This occurs at rates that are only slightly less than competitive female athletes. Early detection of athletes who are at risk is critical to prevent the Triad. Screening for the Triad should be undertaken as part of the Pre-Participation Physical Evaluation (PPE). The PPE should include questions that address all aspects of the Triad spectrums. There is a standardised screening tool that has been endorsed by several medical societies and includes nine questions related to the Triad. How many periods have you had in the past 12 months? The most important risk factors that should be assessed for the triad include; history of menstrual irregularities and amenorrhoea, history of stress fractures, history of critical comments about eating or weight from parent, coach or teammate, a history of depression, a history of dieting, personality factors (such as perfectionism and obsessiveness), pressure to lose weight and/or frequent weight cycling, early start of sport-specific training, overtraining, recurrent and non-healing injuries and inappropriate coaching behaviour. Due to the loss in bone mineral density the primary co-morbidity associated with female athlete triad is osteoporosis. Female athlete triad generally occurs in the primary age range for storing and depositing calcium in the bones (12-19 years old). Slowing or reversing bone development at this age results in the potential to increase the risk of fractures later in life, even after resolving the issues leading to a diagnosis of female athlete triad. Systemically low Bone Mineral Density, low blood estrogen level, and menstrual dysfunction has been linked to Endothelial Dysfunction in endurance athletes. Endothelial Dysfunction is directly related to the bodies ability to constrict or dilate blood vessels. If Endothelial Dysfunction is present (indicated by Brachial Artery flow-mediated dilation) the risk for cardiovascular events, poor blood flow mediation, and atherosclerotic disease are all increased significantly. Antidepressants are often used to treat associated concomitant depression and anxiety disorders. They are also used following weight restoration for bulimia nervosa and anorexia nervosa. Research has show mixed results for improving BMD or restoring menstrual cycles when using hormone replacement therapy (HRT) or oral contraceptive pill (OCP). While BMD may not be improved by using OCP, it may help to reduce further loss in BMD in athletes under the age of 16. Young women with functional hypothalamic amenorrhea should not use biphosphonates that are approved for the treatment of postmenopausal osteoporosis due to their unproven efficacy in women of childbearing age. Also since the medication tend to linger in the bones for many years they have the potential to cause harm to a developing fetus is the patient becomes pregnant later in life. Ovulation inducing agents such as clomiphene citrate and exogenous gonadotropins are indicated if the aim of therapy is to restore fertility. Nutritional therapy has the best evidence for successfully treating female athlete triad due to its ability to in increase energy availability. 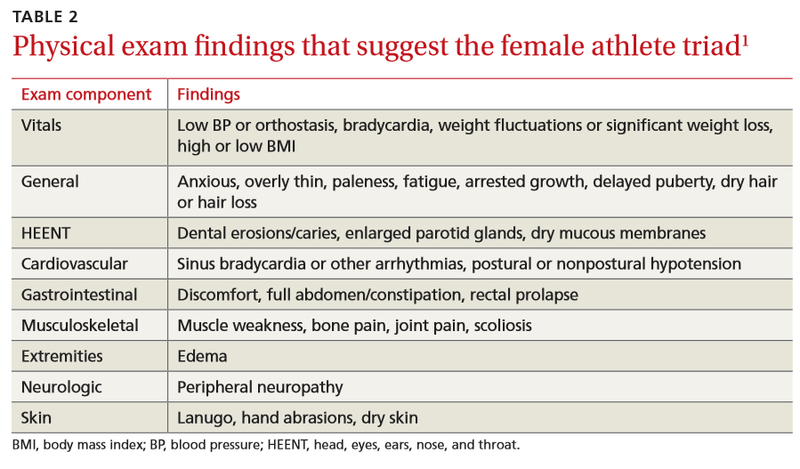 Athletes most commonly show signs of 1 or 2 components of Female Athlete Triad. If suspected due to pain, recurrent fractures, recurrent sprains, Low BMI (<85% expected weight), poor eating habits, or other, use the following questions to see if there is cause for concern. Triggers for disordered eating may include: Prolonged dieting, weight fluctuations, changes in coaching, injury, and social attention to weight. In women, about 90% of bone formation should be complete by 18 years old, with bone density peaking between 20-30 years old. Poor Bone Mineral density is correlated with being <85% expected weight for height and age. A Z-score at or below -1.0 significantly increased risk for fractures and osteoporotic changes. Female Athlete Triad may be caused by one or more of several factors in each individual patient. Low Energy Availability is thought to be the primary cause of Female Athlete Triad. Energy Availability is the dietary energy left in the body after exercise is completed, or total dietary energy in (calories in) minus total exercise energy expended (calories out). Low energy availability is not synonymous with disordered eating. Causes - Restricted Diet, Disordered Eating, Genetic absorption problem. Over-training is also a common factor in Female Athlete Triad. Over-training can be the trigger for the pathology as working your body past a reasonable training schedule prevents it from being able to heal from previous training sessions. This increases metabolic demands and releases stress-related hormones that affect blood flow and is severe cases absorption of nutrients. Over-training may prevent appropriate musculoskeletal recovery, perpetuate high levels of blood cortisol, and negatively affect energy absorption. These factors over time can cause cortical thinning of bones, pathological weakening of muscles and ligaments, and disrupt normal metabolic cycles. Over time the excess stress hormone and physical demand degrade the bone density of the athlete. Over-training is engaging in repetitive stressful activity (>7 Met) for more than 60 min 6 days/week. Integumentary - lax weak ligaments from poor recovery time and nutrition. Musculoskeletal - inability to grow new muscle due to lack of resources and poor recovery time. Strength and endurance depletion from systemic catabolism. Cardiopulmonary and Circulatory - poor blood sugar, poor serum cholesterol and triglycerides, fragile balance of metabolites with decreased ability to compensate for imbalances due to poor storages. Reduced clotting factor. Increased incidence of endothelial dysfunction. Endocrine - increased production of stress hormones, decreased ability to balance homeostatic control due to poor systemic condition from prolonged stress and absent nutrients. Lymphatic and Immune - Immune system becomes fragile due to systemic stress. Neurological - decreased attention span. possibly poor balance. Reproductive System - Reproductive system shuts down (reduced blood flow, reduced metabolism, reduced hormone production) to maintain energy for vital functions. An interdisciplinary team is necessary to manage female athlete triad. Psychologist - there is often a psychological factor that drives disordered eating or over training. Athletes affected with eating disorders have a long-term increased risk of suicide. Primary Care Provider - Important for pharmaceutical management and regular physical check ups. Acute stages: restore or create sufficient nutrition balance for caloric needs. Chronic stages: training may need to be modified to low impact exercise if the patient has suffered extensive disease process. Focus medical treatment on fractures first, restore nutrition to appropriate level, decrease training to appropriate levels. If Z score is less than or equal to -1.0 no high impact activity is allowed and the patient must increase Ca Vit D intake. A lab study to rule out underlying hormonal issues is recommended. Z-score may not reach 1. Return to moderate volumes of high impact activity may take place once Z-score exceeds -1. Lower bone density may persist in life after triad - may improve with resistance training and augmented Ca Vit D consumption. Once a physical therapist notices the signs and symptoms of Female Athlete Triad, it is important that they get other health care professionals involved in the treatment of the patient. Physical Therapists are educated to be experts of movement and the physiological response to exercise, it is imperative that they are involved in patient education and exercise prescription once the patient’s nutritional/energy needs are resolved. Physical Therapists may also help develop criteria for returning to sport. ↑ 1.0 1.1 1.2 1.3 1.4 De Souza, Mary Jane, et al. "2014 Female Athlete Triad Coalition Consensus Statement on treatment and return to play of the female athlete triad: 1st International Conference held in San Francisco, California, May 2012 and 2nd International Conference held in Indianapolis, Indiana, May 2013." Br J Sports Med 48.4 (2014): 289-289. ↑ 2.0 2.1 2.2 2.3 The Female Athlete Triad. Medicine & Science In Sports & Exercise [serial on the Internet]. (2007, Oct), [cited March 27, 2017]; 39(10): 1867-1882. Available from: Academic Search Complete. ↑ 3.0 3.1 Mukherjee S, Chand V, Wong X, Choong P, Lau V, Ng K, et al. Perceptions, awareness and knowledge of the Female Athlete Triad amongst coaches—Are we meeting the expectations for athlete safety?. International Journal Of Sports Science & Coaching [serial on the Internet]. (2016, Aug), [cited March 27, 2017]; 11(4): 545-551. Available from: PsycINFO. ↑ 4.0 4.1 4.2 4.3 4.4 4.5 Thein-Nissenbaum J. Long term consequences of the female athlete triad. Maturitas [serial on the Internet]. (2013, June), [cited March 27, 2017]; 75(2): 107-112. Available from: MEDLINE. 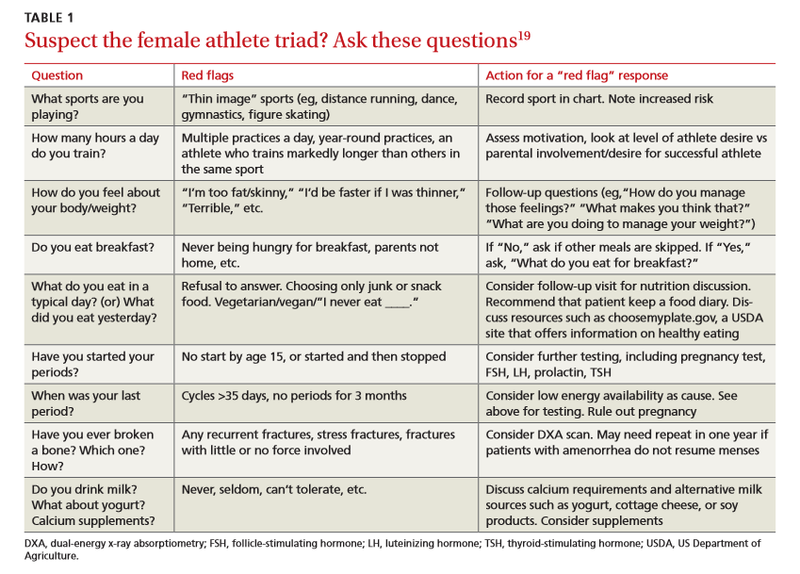 ↑ 5.0 5.1 5.2 5.3 Stickler L, Hoogenboom B, Smith L. THE FEMALE ATHLETE TRIAD-WHAT EVERY PHYSICAL THERAPIST SHOULD KNOW. International Journal Of Sports Physical Therapy [serial on the Internet]. (2015, Aug), [cited March 27, 2017]; 10(4): 563-571. Available from: MEDLINE. ↑ 6.00 6.01 6.02 6.03 6.04 6.05 6.06 6.07 6.08 6.09 6.10 6.11 De Souza M, Williams N, Nattiv A, Joy E, Misra M, McComb J, et al. Misunderstanding the female athlete triad: refuting the IOC consensus statement on Relative Energy Deficiency in Sport (RED-S). British Journal Of Sports Medicine [serial on the Internet]. (2014, Oct), [cited March 27, 2017]; 48(20): 1461-1465. Available from: MEDLINE. ↑ 7.0 7.1 7.2 Mountjoy M, Sundgot-Borgen J, Burke L, Carter S, Constantini N, Ljungqvist A, et al. The IOC consensus statement: beyond the Female Athlete Triad--Relative Energy Deficiency in Sport (RED-S). British Journal Of Sports Medicine [serial on the Internet]. (2014, Apr), [cited April 2, 2017]; 48(7): 491-497. Available from: MEDLINE. ↑ 8.0 8.1 8.2 Gibbs J, Williams N, De Souza M. Prevalence of individual and combined components of the female athlete triad. Medicine And Science In Sports And Exercise [serial on the Internet]. (2013, May), [cited March 27, 2017]; 45(5): 985-996. Available from: MEDLINE. ↑ 9.0 9.1 Hoch A, Pajewski N, Moraski L, Carrera G, Wilson C, Gutterman D, et al. Prevalence of the female athlete triad in high school athletes and sedentary students. Clinical Journal Of Sport Medicine: Official Journal Of The Canadian Academy Of Sport Medicine [serial on the Internet]. (2009, Sep), [cited March 27, 2017]; 19(5): 421-428. Available from: MEDLINE. ↑ 10.0 10.1 Torstveit M, Sundgot-Borgen J. The female athlete triad exists in both elite athletes and controls. Medicine And Science In Sports And Exercise [serial on the Internet]. (2005, Sep), [cited March 27, 2017]; 37(9): 1449-1459. Available from: MEDLINE. ↑ 11.0 11.1 11.2 11.3 11.4 11.5 11.6 Payne J, Kirchner J. Should you suspect the female athlete triad?. The Journal Of Family Practice [serial on the Internet]. (2014, Apr), [cited March 27, 2017]; 63(4): 187-192. Available from: MEDLINE.